DFA has released the November 2018 mortgage stress and default analysis update. Across Australia, more than 1,015,600 households are estimated to be now in mortgage stress (last month 1,008,000). This equates to 30.9% of owner occupied borrowing households. In addition, more than 22,500 of these are in severe stress. We estimate that more than 61,000 households risk 30-day default in the next 12 months. We continue to see the impact of flat wages growth, rising living costs and higher real mortgage rates. The latest RBA data on household debt to income to June reached a new high of 190.5. This high debt level helps to explain the fact that mortgage stress continues to rise. Bank losses are likely to rise a little ahead. 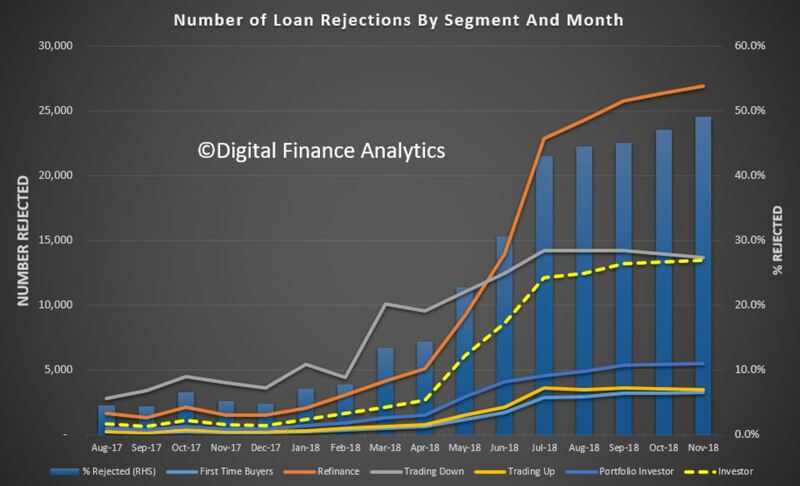 Our analysis uses the DFA core market model which combines information from our 52,000 household surveys, public data from the RBA, ABS and APRA; and private data from lenders and aggregators. The data is current to the end of November 2018. We analyse household cash flow based on real incomes, outgoings and mortgage repayments, rather than using an arbitrary 30% of income. Martin North, Principal of Digital Finance Analytics says this rise in stress, which has continued for the past 6 years, should be of no surprise at all. “Continued rises in living costs – notably child care, school fees and food – whilst real incomes continue to fall and underemployment is causing significant pain. 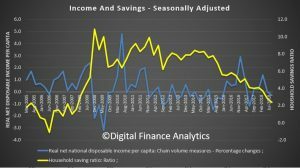 Many are dipping into savings to support their finances.” The latest ABS GDP numbers confirmed the falling savings ratio. 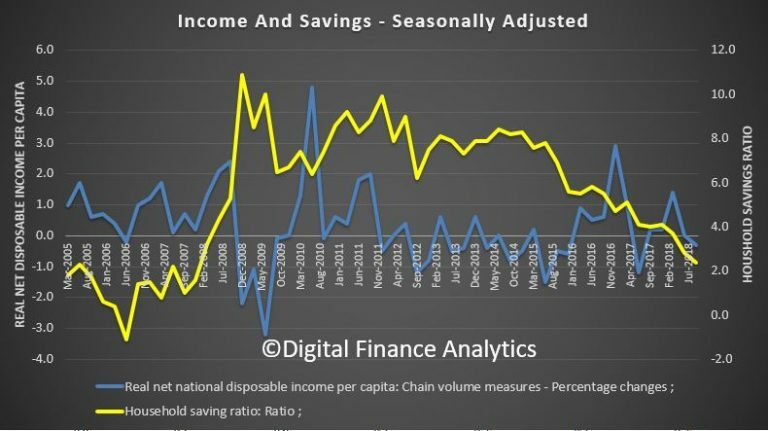 Indeed, the fact that significant numbers of households have had their potential borrowing power crimped by lending standards belatedly being tightened, and are therefore mortgage prisoners, is significant. More than 49% of those seeking to refinance are now having difficulty. This is strongly aligned to those who are registering as stressed. These are households urgently trying to reduce their monthly outgoings”. In addition, negative equity is now rearing its head. Data from APRA, the Property Exposures figures – showed that banks wrote nearly 26,000 new mortgages with a loan to value ratio of more than 90%, and a further 51,000 with an LVR of between 80 and 90 percent. That is 20% of all loans written in the same period. 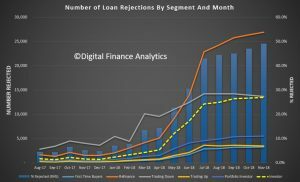 I would expect these numbers to fall significantly, as lenders tighten their standards further. But it’s also worth remembering that in some cases existing borrowers have pulled more equity out to allow them to pass funds to their kids – the so called bank of Mum and Dad, and in the case of a forced sale, the market value may well overstate the true recovery value of the property. Using a property as an ATM does not work in a falling market. We have run our own analysis with data to the end of November and on my modelling currently there are around 400,000 households across the country in negative equity, both owner-occupiers and investors. There are about 3.25 million owner-occupier borrowers and at least 1.25 million investors, so around 10 per cent of properties are currently underwater. We run a range of potential scenarios, but if our central case works out, with an average fall of 20-25 per cent, our modelling suggests that around 650,000 households would fall into negative equity. My more severe case, if an international crisis hits is for a 40 per cent price fall. Then you’re getting close to one million households. That would be catastrophic for the economy. That’s analogous to what happened in Ireland where prices dropped 40 per cent. A decade later, there are still people in negative equity who’ve never recovered. The next question to consider is which households are being impacted. In fact, negative equity is touching “lots of different segments” of the market for different reasons, but collectively it is an “early warning sign” for what is to come. 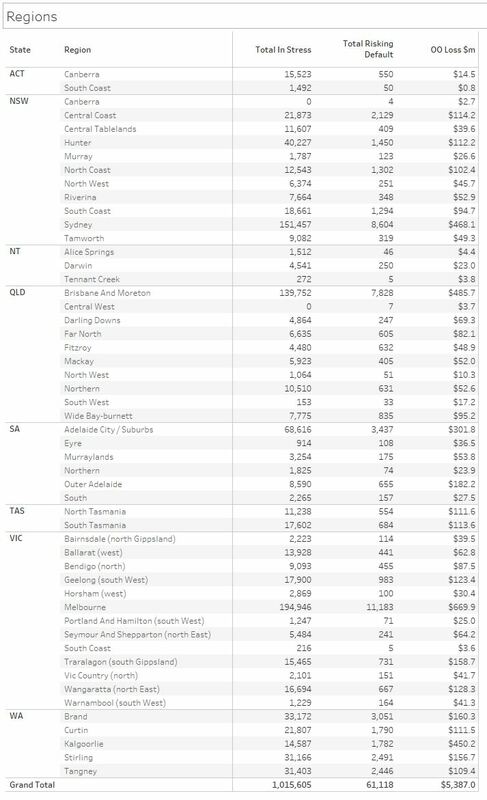 Regional analysis shows that NSW has 281,275 households in stress (272,536 last month), VIC 283,395 (281,922 last month), QLD 181,156 (178,015 last month) and WA has 132,135 (132,827 last month). The probability of default over the next 12 months rose, with around 11,560 in WA, around 11,300 in QLD, 15,300 in VIC and 16,200 in NSW. The largest financial losses relating to bank write-offs reside in NSW ($1.1 billion) from Owner Occupied borrowers) and VIC ($1.47 billion) from Owner Occupied Borrowers, though losses are likely to be highest in WA at 3.6 basis points, which equates to $1,000 million from Owner Occupied borrowers. 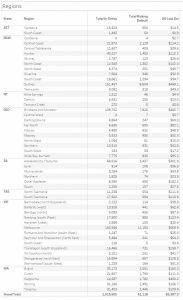 Here are the top postcodes sorted by number of households in mortgage stress. That’s stressful. Surprised the RBA did not move down. Um what happened to commentators being portly middle aged white men? I’m more concerned about a solar flare. No GPS tracking on me bike! Holy shnikies! There really is no need for anyone to stress nowadays because great relief can be had at any one of the numerous asian massage lounges situated in each and every suburb and town. You are my idol and hero, Reus!!! Even his chart backgrounds are dark and doomy! Does anyone actually know how this ‘core market model’ is put together at all? 52,000 household surveys? That sounds like a market research style omnibus survey? Martin are you out there? Martin has answered that in Comments before. It’s on his website I think. 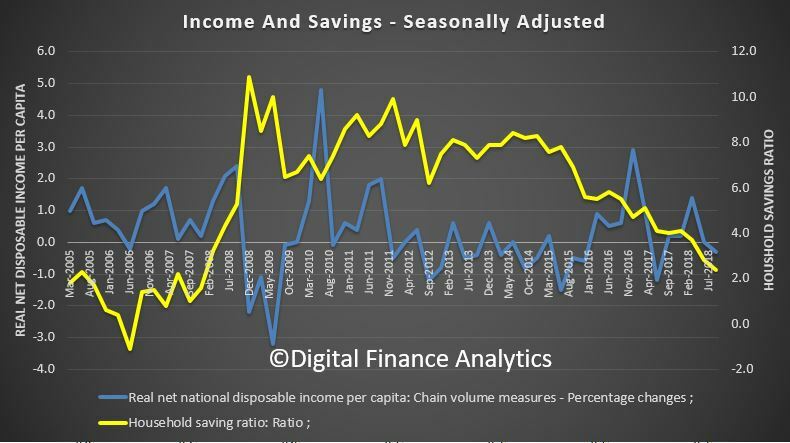 Also, Josh Frankingburg, suggested that the drop in savings rates is due to people feeling more confident on Sky News. Another tweeter suggested to me that any drop in unemployment would only be due to people feeling confident enough to give up working. 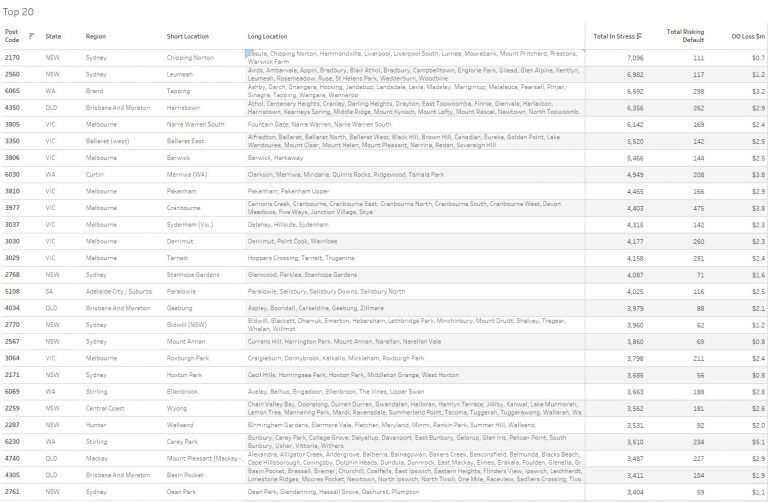 Look at the postcode for Melbourne – mostly heavy migrant areas. Exodus will be no different to every other country this has happened in. Out of curiosity, anyone with a hefty deposit or sum of money moving it out of Australia, if so how and where. If not, will you spread it across multiple ADI’s “just in case” things get nasty next year? Not really a fan of Crypto but ill look into the US government bond etfs. Can you point me in the right direction for more info/rates/security on this product. That SAXO forecast really struck a nerve.